TrafFix Devices ANSI/ISEA Class E Safety Pants come in a variety of styles and colors to meet your safety needs. Each Class E Pant feature extremely bright coloring throughout the pant, reflective stripes at the bottom of each leg, and 2 pocket openings for easy access to pants pockets. With its slastic waist band, these Class E Pants will fit over most types of clothing; everything from shorts and a t-shirt to heavy winter clothing. Our Mesh material is a soft, lightweight fabric that meets or exceeds the specification for ANSI/ISEA 107-2010. This lightweight, breathable material allows air to flow through the pants, keeping them cool on hot days, yet durable enough for the construction industry. 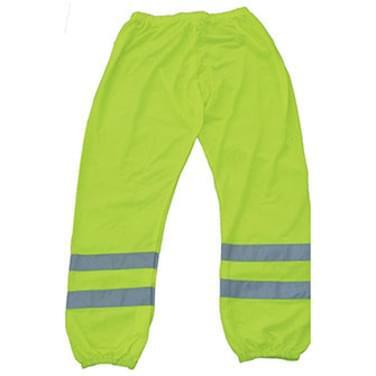 Lime ANSI Class E lightweight mesh pants with two (2) 2" horizontal silver reflective stripes. The pants have two (2) pocket openings on either side and an elastic waist band which can accommodate waist sizes from 28" to 48". Available sizes range from Medium to X-Large. 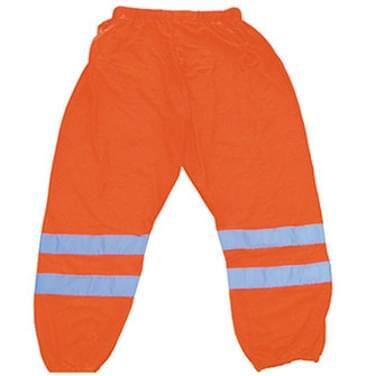 Orange ANSI Class E lightweight mesh pants with two (2) 2" horizontal silver reflective stripes. The pants have two (2) pocket openings on either side and an Elastic Waist Band which can accommodate waist sizes from 28" to 48". Available sizes range from Medium to X-Large.